Topps produced a set of sixty-nine 10″ by 14″ prints of the Major League Baseball All-Stars this summer, which were limited to 99 copies each and sold through Topps.com for $34.99 a piece. At the All-Star Fan Fest in Minnesota, Topps sold smaller (5″ by 7″) versions that are not serial numbered. 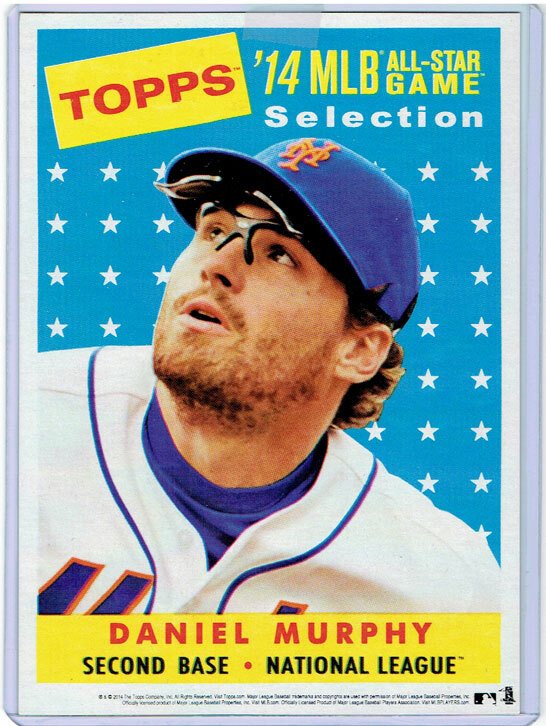 I learned about the All-Star Fanfest version while searching eBay for the Daniel Murphy All-Star cards in the Topps Update set. I picked up Murphy’s All-Star Fanfest card for $5.49 shipped. I’m not quite sure how the oversized blank-backed baseball card fits in my collection – if Murphy is still a Met next spring, maybe I’ll frame it and hang it on the wall. Previous Post What does the Yankees’ lack of interest in this year’s top free agents mean? Nice. Hadn’t seen these yet. I think they slipped under the radar of lots of people.